If you’re tired of wearing the same jeans or trousers day after day, you should consider investing in a pair of leather pants. Made from the same leather fabric as leather bomber jackets, they offer an unparalleled level of aesthetics and comfort. To take advantage of these benefits, though, you need to choose the right type of leather pants. Leather pants are available in dozens if not hundreds of different styles. So, how do you know which pair is right for you? You may discover that some leather pants are labeled “faux” or “PU leather.” While these alternative styles look like real leather, they are made of a completely different fabric. Therefore, faux and PU leather pants don’t offer the same benefits as genuine leather pants. When shopping for leather pants, check the tag to see what fabric it’s made of. Unless it’s made of genuine leather, put the pants back and choose a different pair instead. Leather pants aren’t as common as traditional jeans and trousers. As a result, you may struggle to find them for sale when shopping at local apparel stores and malls. You can still find leather pants available for sale; you just need to shop smart and not hard. Here at LeatherCult, for example, we offer one of the largest selections of high-end, genuine leather pants at unbeatable prices. 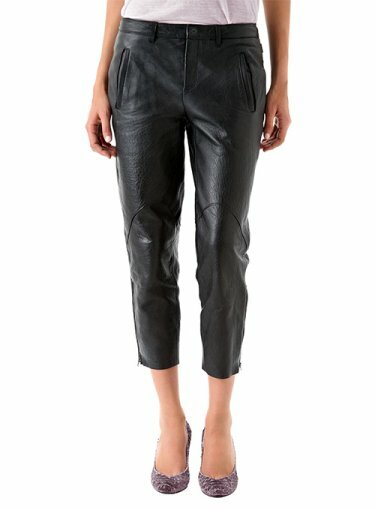 Rather than wasting a weekend driving around from store to store, check out the leather pants offered on our website. From the comfort and convenience of your computer, you can order the perfect pair of leather pants. What type of style are you looking for? You need to answer this question when shopping for leather pants. While some leather pants feature a traditional design with sleek, shiny leather, there are countless other styles from which to choose. Some leather pants, for instance, are designed to mimic the appearance of jeans. They are still made of genuine leather, but they are designed with a light blue color and whisker patterns, making them look like a unique pair of jeans. Find out which style you prefer and then go shopping for leather pants. Pockets are a small feature in leather pants that play a big role in their overall appearance as well as their functionality. If a pair of leather pants don’t have pockets, they may look somewhat generic and plain. Furthermore, you won’t be able to store small items like your car keys and cash in your leather pants unless they have pockets. So, when shopping for leather pants, check to see whether it has pockets. And if a pair of leather pants has pockets, look to see how many pockets it has and where they are located. Not all leather pants feature a traditional length that stops at or around your ankles. Granted, this is the most common length in which leather pants are made, but you can find this garment in other lengths as well. To get the most use out of your leather pants, it’s recommended that you choose a seasonally appropriate length. If you’re planning to wear your leather pants during the winter, choose full-length leather pants that stop at or around your ankles. On the other hand, if you’re planning to wear your leather pants during the spring or summer, choose a short length. As shown above, some leather pants have a shorter length that stops around your calf muscles. The slightly shorter length makes this style ideal for the warmer spring and summer months. The boot-cut style is typically associated with jeans. As you may know, boot-cut jeans have a larger opening around the bottom so that you can fit them over the top of your boots. The purpose of this larger opening is to prevent the bottom of the pants from dragging on the ground, which could cause permanent damage. While most commonly associated with jeans, however, some leather pants are available in this same style. Boot-cut leather pants are perfect to wear with boots. Like boot-cut jeans, they prevent the bottom of the pants from dragging on the ground. Don’t assume that all genuine leather pants are made equal. Some companies use cheap leather to produce their pants, resulting in a lackluster performance. You may save a couple bucks by choosing a pair of cheap, low-quality leather pants, but this doesn’t mean that it’s a smart investment. Low-quality leather is more likely to dry out, crack and succumb to other forms of damage than high-quality leather. To prevent this from happening, you need to choose pants made of genuine, high-quality leather. Napa leather is considered one of the world’s highest-quality types of leather. The term “Napa leather” was coined by a worker at the Sawyer Tanning Company in the late 1800s to describe a particularly high-end type of leather with a soft hand. The supple texture of Napa leather makes it a highly effective fabric for use in leather pants. Napa leather pants are soft, supple and super comfortable to wear. They are gentle on your skin, yet because they are made of genuine leather, they are still strong and durable. You’ll have an easier time choosing leather pants that fit your body by ordering them here at LeatherCult. Using our online store, you can specify your body measurements to ensure that your leather pants fit perfectly.